I hadn’t done very much theater before I moved back to Tampa a few years ago, but I knew I wanted to keep doing it. I had to do some research about the local community theaters before going to auditions, so in the fall of 2008, I summoned up my courage and headed over to see The Mousetrap at Carrollwood Players. I remember thinking about how intimate the space was and how close I was to the actors. I also remember thinking it was a first-rate production. The cast was excellent, as were the costumes. But what really knocked my socks off was that set! It was exquisite and far beyond what I thought community theater was capable of. I decided that Carrollwood Players had incredible production quality and I wanted to “join”. I was ready, primed, and excited about finding a place that invested so much love into its shows. Plus, it was close to my house, which is a great bonus. The next step was finding an audition. Finding them was easy; a quick internet search revealed auditions….for plays. Plays? Ugh, I wanted a musical! I waited. And waited. And waited. For several years. Then, in the summer of 2011, there was an audition listing for a Holiday Musical at Carrollwood Players. Even though I was confused about the show’s premise, I knew it was a chance to sing at a theater I admired. I prepared a short song, ratcheted up my courage and ventured in on a Sunday evening in August. My heart was pounding as I pulled into the parking lot. “This place has The Players. These are serious actors. Why didn’t I volunteer as crew a few shows ago to get a foot in the door? I bet this place is super clique-y. I have only been in a handful of shows. I bet that’s not enough!” My head was swimming as I walked in the door. Auditioning was very straightforward. I filled out a form with my basic info. and acting history. No need for a headshot or resume (that was a huge relief for a newbie like me.) The director, Tiger Von Pagel, gave us a speech about what the show was going to require and how the evening would go. I was calming down, especially when she made her own husband audition. It was a small gesture, but it was professional and alleviated a lot of my worries. I had some nerves, but I made it through. A few days later Tiger called me and offered me a part. The Holiday Revue wasn’t a traditional musical, but it got me in the door. After that show, I started auditioning for the plays as well. 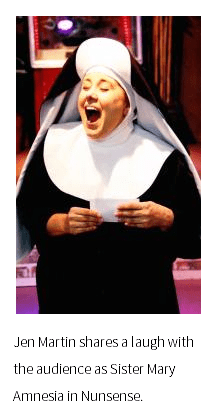 Much to my delight, in September of 2013, Carrollwood Players came back to musicals with Nunsense. That show’s success heralded a new beginning of sorts for Carrollwood, with a decision to attempt at least one musical per season. I know from personal experience that putting on a musical will get more actors to audition, and some might even stay for the plays, like I did. Since “joining” in 2011, I’ve been involved in at least ten productions at Carrollwood Players and am now on the Board of Directors. One of the things I love the most about this theater is that, even with my level of involvement, I still have to audition. I still get nervous, and I still worry about getting a call back, because casting isn’t based on who you know. When I see a scared new face at a Sunday evening audition, I try to reach out, because I remember so well the daunting feeling of trying to “join”. I remember how much it took to walk through that door for the first time, and how much a friendly smile and professional process made it so much easier. Looking back, walking through that door was a pivotal moment in my life; I had no idea what I was getting into, but I’m so glad I came and tried to “join” on that Sunday in August. And I hope you will, too! Why Community Theatre? Fret Not!